In 1884 the French occultist Saint-Yves d’Alveydre (1842-1909) decided to take lessons in Sanskrit. Having just published his definitive work on the secret history of the world, called Mission des Juifs (“Mission of the Jews”),2 he was anxious to deepen his understanding of the sacred languages which, he felt sure, concealed the ultimate mysteries. Hebrew had already revealed much to him; now it was time to tackle the even more ancient language of Sanskrit, parent of all the Indo-European tongues. Saint-Yves’ Sanskrit teacher, who called himself Hardjji Scharipf, was a character of hazy origins and the subject of various rumours. Born on December 25, 1838, he supposedly left India after the Mutiny of 1857 and set up in the French port of Le Havre as a bird-seller and professor of Oriental languages. His name may have been a pseudonym; he may have been an Afghan; some called him Prince. But whatever his story, the manuscripts now in the Library of the Sorbonne in Paris show that Hardjji was a learned and punctilious teacher, and the source of two still unsolved enigmas: the underground kingdom of Agarttha, and its sacred language. Saint-Yves must have asked him what this “Great Agartthian School” was. He might already have read in the books of the popular travel writer and historian Louis Jacolliot of an “Asgartha,” supposedly a great city of the ancient Indian priest-kings, the “Brahmatras.”3 Does such a place still exist, then? Apparently Hardjji gave him to believe so, and, what is more, that it preserves a language and a script, known as “Vattan” or “Vattanian,” that are the primordial ones of mankind. For someone in quest of the secret and sacred roots of language, the mention of such things must have been unbearably exciting. Later he must have taught Saint-Yves the Vattanian alphabet and the principles behind its 22 letter-forms, which Saint-Yves would correlate with the Hebrew alphabet and with the zodiacal and planetary symbols. And this was not all. 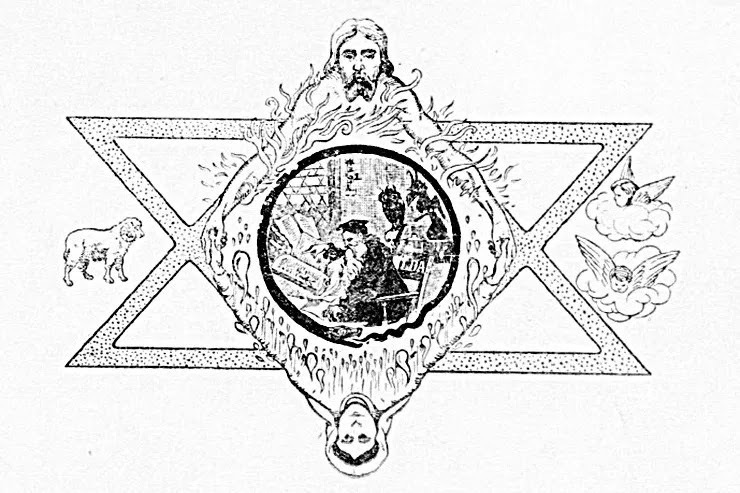 Did Hardjji know that Saint-Yves was writing another book – The Kingdom of Agarttha: A Journey into the Hollow Earth – under the influence of his Oriental studies? It seems doubtful, but in 1886 the book was finished, typeset, and printed by his regular publisher (Calmann Lévy). This realm, Saint-Yves explains, was transferred underground and concealed from the surface-dwellers at the start of the Kali Yuga (the present dark age in the Hindu system of chronology), which he dates to about 3,200 BCE. Agarttha has long enjoyed the benefits of a technology advanced far beyond our own, including gas lighting, railways, and air travel. Now and then Agarttha sends emissaries to the upper world, of which it has a perfect knowledge. Not only the latest discoveries of modern man, but the whole wisdom of the ages is enshrined in its libraries, engraved on stone in Vattanian characters. Among its secrets are those of the true relationship of body to soul, and the means to keep departed souls in communication with the living. When our world adopts Synarchical government, the time will be ripe for Agarttha to reveal itself, to our great spiritual and practical advantage. In order to speed this process, Saint-Yves includes in the book open letters to Queen Victoria, Emperor Alexander III of Russia, and Pope Leo III, inviting them to join in the great project. Perhaps the oddest thing about this book is Saint-Yves’ own stance. Far from presenting himself as an authorised spokesman for Agarttha, he admits that he is a spy. Dedicating the book to the Sovereign Pontiff and signing it with his own name in Vattanian characters (just as Hardjji had written it out for him), he expatiates on how astounded this august dignitary will be to read the work, wondering how human eyes could have penetrated the innermost sanctuaries of his realm. Saint-Yves explains that he is a “spontaneous initiate,” bound by no oath of secrecy, and that once the Brahatmah gets over the shock, he will admit the wisdom of what Saint-Yves has dared to reveal. In the present work he seems to have extended his psychic vision, to say the least, and one can glean from here and there an idea of his methods. There is, for instance, a passage here describing in detail how the Agartthian initiates travel in their souls while their bodies sleep. Then there is the passage in the notebook already mentioned, on yogic exercises for separating the soul from the body. “A magnetiser, he said, runs less danger than others in duplicating himself, because he is more trained. Saint-Yves presumably possessed the secret of this “somnambulistic” faculty, and used it to gather the information he presents in this book. But did he gather it, as he claims, from spying on a physical Agarttha beneath the surface of the earth? Or was it the result of his own projected fantasies or hallucinations? Or, again, did it come from some non-physical location or state which can be accessed under certain conditions, but which then merely supports the psyche’s own subjective expectations and prejudices? We will return to these questions at the end. Decades later, it turned out that the printer, Lahure, had secreted another copy.7 The late Jean Saunier, biographer and chief authority on Saint-Yves, used this as the basis for the complete French edition of 1981, now translated into English. Whatever reasons and motives were responsible for the sudden withdrawal of the book, there is no doubt that Saint-Yves remained true to his vision. For instance, he mentions Agarttha and names its three rulers in his epic poem of 1890, Jeanne d’Arc victorieuse. In his conversations with Erny in 1896, he stated outright that there exists a secret “Superior University” with a “High Priest” who is currently an Ethiopian, and other details just as they appear in this book. Finally, he mentions Agarttha in veiled terms in L’Archéomètre, the major work of his last years. It told of his flight through Central Asia in the aftermath of the Russian Revolution. While in Mongolia, he heard tell of a subterranean realm of 800,000,000 inhabitants called “Agharti”; of its triple spiritual authority “Brahytma, the King of the World,” “Mahytma,” and “Mahynga,” of its sacred language, “Vattanan,” and many other things that corroborate Saint-Yves. The book ended on a dramatic note of prophecy from one of Ossendowski’s informants: that in the year 2029, the people of “Aghardi” will issue forth from their caverns and appear on the surface of the earth. An unprejudiced reader, finding in three chapters of Ossendowski’s book a virtual outline of Saint-Yves’ Agarttha, not omitting the most improbable details, would conclude that the author had capped an already good story with a convenient piece of plagiarism, altering the spellings so as to make his version, if challenged, seem informed from an independent source. So Guénon at the very least did not deny a geographical Agarttha. To his way of thinking, if one were found to exist beneath the surface of the earth, it would only corroborate the superior reality of the symbolic one. Ossendowski’s account was later investigated by Marco Pallis (1895-1985), the traveller, writer on Buddhism, and translator of Guénon, with the advantage of his own contacts with highly-placed Indians, Tibetans, and Mongolians.15 One of the latter, now very old, had been the head lama of a monastery at the time of Ossendowski’s visit there. He testified that the latter’s stories of the King of the World and of Agarttha bore no relation to any authentic legend or doctrine whatsoever, and that Ossendowski’s command of the Mongolian language had not been nearly sufficient to understand what he claimed to have heard. Pallis’s Hindu friends, similarly, disclaimed any Sanskrit source for Agarttha. The inevitable conclusion was that the credulous Guénon had been misled by Saint-Yves’ fantasy, and that promoting belief in Agarttha in Le Roi du Monde had been a foolish mistake. Never mind: once his best-seller had brought the Agarttha myth out of the esoteric closet, it began to enjoy a new lease on life. If we set aside Saint-Yves and Ossendowski, for reasons already explained, there remain only two independent witnesses to an Indian Agarttha tradition. Louis Jacolliot was led to place it in the past, as the ancient Brahmanic capital. For Hardjji Scharipf it was a living initiatic school with its own secret script. Until a reputable scholar comes forward with data on the myth of Agarttha, and especially on the Vattanian alphabet,18 my working hypothesis is that these were part of a mythology belonging to a restricted and obscure Indian school, which has only surfaced to Western notice on these two occasions. However, Saint-Yves wanted more than the tantalising taste that his Sanskrit teacher allowed him. He therefore decided to use his gift for astral travel to explore Agarttha further, and was rewarded by visions of an underground utopia and its Sovereign Pontiff, the spiritual Lord of the World. What is the source, and the ontological status, of such visions? There are, one gathers, definite places or complexes in the Astral World (also known as the “Inner Planes” of magic), which present to the clairvoyant visitor certain invariable features. But the incidental circumstances of such a place vary, according to the visitor’s own cultural conditioning and expectations. Some find themselves, for example, in what they believe to be the Alexandrian Library, or in Atlantis, i.e., a place of the past. To others, it seems current and contemporary, though preferably in an inaccessible location like the Himalayas. The décor is a trivial matter, of course, in comparison to the philosophical truths to be discovered there, but the glamour of it sometimes overwhelms the traveller. Then his attention fixates on irrelevant details, and an inflated sense of self-importance may result. Thus Saint-Yves, convinced that he has penetrated to the realm of the world’s spiritual ruler, writes about four-eyed tortoises, two-tongued men, levitating yogis, and ends up addressing pompous letters to Queen, Emperor, and Pope. I can accept that in some state of altered consciousness he saw what he claims to have seen. But like many who habitually indulge in altered states, he was not able to situate his visions, nor himself as witness to them, with the requisite philosophical detachment. The result is a classic case of the occupational hazard of occultists: misplaced concretism. Yet there is a grandeur to this book. Its vivid and elegant prose lift it far above the tedious wordiness of visionary and channelled writing. In sheer weirdness of imagination it rivals the fantasy fiction of H.P. Lovecraft or Jorge Luis Borges, while in deadpan seriousness and titanic self-confidence it compares to prophetic works like the Book of Ezekiel or the various Apocalypses. And it reminds us that the earth is a very strange place, with many unexplored corners, many enigmas, and many surprises in store for us surface-dwellers. 1. Abbreviated from the author’s Introduction to Saint-Yves d’Alveydre, The Kingdom of Agarttha: A Journey into the Hollow Earth, trans. Jon Graham, Rochester, Vt.: Inner Traditions International, 2008. 3. See especially Louis Jacolliot, Le Fils de Dieu (Paris: Lacroix, 1873), 263-266, quoted in Jean Saunier, Saint-Yves d’Alveydre, une Synarchie sans énigme (Paris: Dervy, 1981), 350-353. 4. Sorbonne, Ms. 1423, page 118 onwards. Some of this material would appear in the posthumously published work L’Archéomètre (Paris: Dorbon, 1911); English translation by Ariel Godwin as The Archeometer: Key to All the Religions and Sciences of Antiquity. Synthetic Reformation of All Contemporary Arts (n.p. : Sacred Science Institute, 2008). 5. Saint-Yves d’Alveydre, Clefs de l’Orient (Paris: Didier, 1877; reprinted Nice: Belisane, 1980). 6. Sorbonne, Ms. Carton 42, fragment G, pp. [7-8]. Erny was the author of Le Psychisme experimentale (Paris: Flammarion, 1895). His notes on conversations with Saint-Yves, dated August, 1896, are divided between the Sorbonne and the Bibliothèque Municipale de Lyon, Ms. 5493. 7. See Introduction by Jean Saunier to Saint-Yves d’Alveydre, Mission de l’Inde (Nice: Bélisane, 1981). 8. Ferdinand Ossendowski, Beasts, Men and Gods (New York: Dutton, 1922). The book was written in English, with assistance from Lewis Stanton Palen. 9. Beasts, Men and Gods, 413. 10. Quoted in Paul Chacornac, La Vie simple de René Guénon (Paris: Editions Traditionnelles, 1958), 77n. 11. See Robert Amadou, “L’Erreur spirite de René Guénon,” in Sphinx (Beaugency), no. 3/4 (Autumn 1978), 21 unpaginated pages; no. 5 (Spring 1979), 45-60; no. 7/8 (Autumn/Winter 1979), 83. 12. René Guénon, “Le Roi du Monde,” in Les Cahiers du Mois, 9/10: Les Appels de l’Orient (Paris: Emile Paul Frères, 1925), 210. This statement was modified in Guénon’s Le Roi du Monde (Paris: Bosse, 1927); see next note. 13. René Guénon, The Lord of the World, trans. Anthony Cheke (Ellingstring: Coombe Springs Press, 1983), 2-3. 14. The Lord of the World, 66. 15. See Marco Pallis, “Ossendowski’s Sources” in Studies in Comparative Religion, vol. 15, no. 1/2 (1983), 30-41. 16. See the anonymous review, “The Ossendowski Controversy,” in The Geographical Journal, 65/3 (1925), 251-254, which reproduces Ossendowski’s statements in French and English. 17. See my Arktos: The Polar Myth in Science, Symbolism, and Nazi Survival (Grand Rapids: Phanes Press/London: Thames & Hudson, 1993; reissued Kempton, IL: Adventures Unlimited Press, 1996), 79-104, and the references given there. 18. On Vattanian, see Mike Jay and Joscelyn Godwin, “Licked by the Mother Tongue,” in Fortean Times, 97 (April, 1997).